The way the River Nile branches, the size of craters on the moon, the brightness of a star, the frequency of words in a language, fluctuations in the financial markets, the link between mortality and heart rate, the size of cities – a host of apparently random natural and man-made phenomena are all connected at some deep mathematical level. 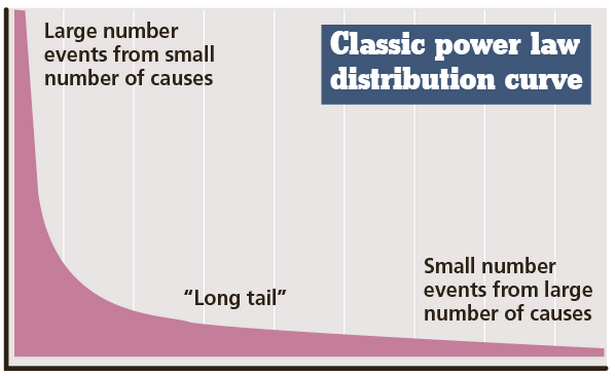 They all have the underpinning of a power law – a statistical relationship between two quantities often depicted by a graph showing a steep initial curve and a long tail. It’s sometimes known as the 80:20 rule as 80% of the effects emerge from 20% of the causes. The theme is so entrenched in the fabric of complex systems that some scientists have argued that a society’s uneven wealth distribution – which follows the 80-20 rule – is an inevitable part of the natural order. Occupy protesters are wasting their time, say some “econophysicists”. Now scientists from the Queen Mary University of London have discovered that the apparently chaotic growth of a cancer tumour follows a power law pattern too. Their results have been published in Nature Genetics and could lead to breakthroughs in targeted treatments. The ability to predict the growth of a tumour and the frequency of its genetic mutations is invaluable in a field where cancer therapies rely on the recognition of specific molecules. Study co-leader Dr Trevor Graham , head of the Evolution and Cancer laboratory at the Barts Cancer Institute at QMUL , said: “We often think of cancers as being the chaotic and uncontrolled growth of cells. But our study shows how cancer evolution is in fact often highly ordered and can even be explained by [this] straightforward mathematical rule. Study co-leader Dr Andrea Sottoriva said: “This predictability means that the vast amount of genetic data we generate from tumour biopsies could tell us how a given cancer will develop over time – which mutations will come to drive it into more aggressive disease, when they will emerge, and which drugs are best to treat them. 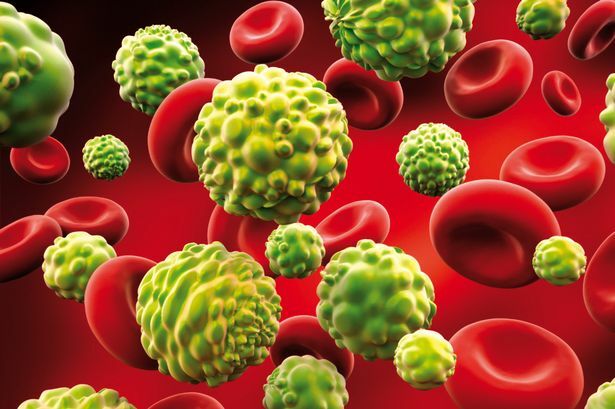 As a typical tumour has more cells than people on the planet, finding patterns appeared like a tall order for the team led by Queen Mary University of London and the Institute of Cancer Research . The scientists expected to see chaos in the bowel, lung and stomach cancers they studied – and they found it. Then they began to look for patterns – and they found those too. The key to understanding the patterns was the frequency of the genetic mutations. When cells divide they form two daughter cells containing duplicate DNA. While the replication is normally accurate, imperfections do occur and those imperfections are copied again and again. It means that the frequency of the early errors is greater than those of later mutations. Dr Graham said: “The process of DNA replication is a bit like making multiple photocopies – each successive round of copying contains slight imperfections compared with the original, which build up over time. In this way, the DNA from the first cell is progressively distorted as the cancer grows. The accumulation of mutations had a precise mathematical relationship correlation, echoing, for example, the relationship of the number of large earthquakes to the number of small, or the number of species in a small plot of land compared to a large. “This suggested we could expect to find a power-law underlying cancer’s growth. And that’s exactly what we did find. It is a first entry in what we hope will become a ‘mathematical rulebook for cancer’, that will serve to improve our understanding of the disease. ■ Data distributed as a power law model is sometimes called the Pareto principle or 80-20 rule which says that 80% of effects come from 20% of the available causes. ■ A familiar example of the “80-20” rule is that 80% of the wealth is held by 20% of the people. ■ It was named after Italian economist Vilfredo Pareto, who, in 1896 showed that approximately 80% of the land in Italy was owned by 20% of the population; and that 20% of the peapods in his garden contained 80% of the peas. ■ Business practice also holds to this. Microsoft noted that by fixing the top 20% of the most-reported bugs, 80% of the related errors and crashes would be eliminated. ■ 80% of a company’s profits come from 20% of its customers. ■ 80% of a company’s complaints come from 20% of its customers. ■ 80% of a company’s profits come from 20% of the time its staff spend. ■ 80% of a company’s sales come from 20% of its products. Next articleHow did London become Fintech’s golden goose?